One of the most eminent Chinese Buddhist masters of the twentieth century, the Venerable Master Hsuan Hua [Xuanhua] was a monastic reformer and the first Chinese master to teach Buddhism to large numbers of Westerners. During his long career he emphasized the primacy of the monastic tradition, the essential role of moral education, the need for Buddhists to ground themselves in traditional spiritual practice and authentic scripture, and the importance of respect and understanding among religions. He focused on clarifying the essential principles of the Buddha’s original teachings, on establishing a properly ordained monastic community, on organizing and supporting the translation of the Buddhist Canon into English and other languages, and on the establishment of schools, religious training programs, and programs of academic research and teaching. 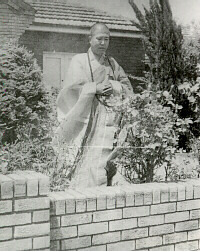 In 1961, the Venerable Master spent a quiet year in Australia. Back then, there wasn't the interest in Buddhism in the Australian community that there is today. Nevertheless, the Venerable Master 'planted the seeds' of Buddhism on this continent, before heading to the USA. Fifty years later, Buddhism is now flourishing in the Australian community, with an increase of 48% in the number of Buddhists from 2001 to 2011, at the last ABS census for a total of 529,000 people. It is an exciting time to be a part of the Buddhist Community in Australia and GCDR aspires to finally bring the Venerable Master's teachings to those who seek them. I visit Australia often and realized that there was a shortage of monasteries in the Mahayana Chinese tradition. In my resolve to help the Master realize his vision, I started my search for a suitable piece of land. In 1991 I found a 53- acre piece of land. However, after we submitted a plan to the Gold Coast City Council, the restrictive conditions they set made it unfeasible to develop this plot of land as a monastery. I set forth to look for an alternative site and found the present 22-acre lot in 1996. Within four months, we were able to purchase the land, apply to the Council for rezoning, and obtain approval from the City Council. Building plans and environmental reports were subsequently submit ted and approved. In the months following the proposal, Southeast Asia was hit by a severe economic crisis towards the end of 1997. My stocks and shares were badly affected by the crash of the stock and property market and almost overnight, my personal net worth was reduced to about ten percent of its pre-crash value. This financial crisis was a severe ordeal for me, and I was extremely worried that I might not fulfill my vow of building the monastery. I sold the various properties that I had in Australia and together with the help and generous support of friends and fellow Buddhists, we continued to work towards the Master's vision. The original plan was scaled down and building began. I am now pleased to report that we have made a modest start with the completion of the basic facilities and amenities. Since April this year we have had nuns and monks from CTTB visit the place to give Dharma lectures. These lectures were attended and well-received by both locals and well-wishers from Singapore and Malaysia. In July this year, with the visit of Reverend Heng Tso and Reverend Heng Yuen, I handed over the monastery to DRBA without any conditions and I am sure that the place will scale new heights in times to come. Since I met the Master in 1978, his expedient teaching and guidance have influenced me to change my ways and lifestyle for the better. I have also learned the higher values of life in this material world. I sincerely hope that by establishing this branch of CTTB in Australia, many people as well as sentient beings will hear the proper Dharma and be able to similarly change their values and lifestyle. I wish for them to experience the benefits of the Master's teachings, without which I would still be lost in this samsaric ocean. fulfillment of my vows. In particular, I am grateful to Reverend Heng Sure for his advice and words of encouragement. Finally, I would also like to say that I am, and will always be grateful to the Buddhas, the Bodhisattvas, and the Venerable Master for showing me the way. Amitabha!